When I was at college I studies French as one of my A-level subjects and since I came out with a grade A I’ve always fancied myself as having a pretty good grip on the language. Despite this I’ve never read anything longer than a few pages so I’ve never really tested my abilities. 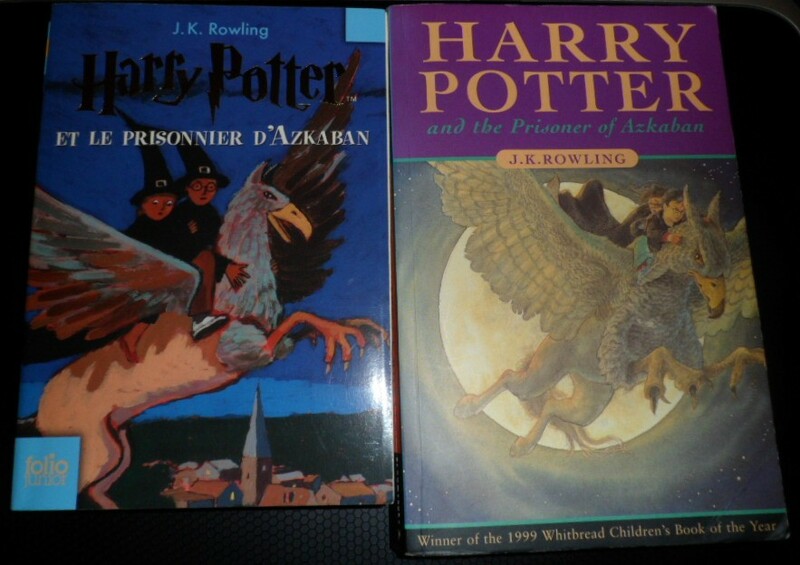 A couple of years ago a friend bought me a French edition of Harry Potter and the Prisoner of Azkaban which seemed like an excellent opportunity to see just how good I am. In case you think it’s a bit strange that she bought me the third book in the series I should point out that it’s a very poorly kept secret that The Prisoner of Azkaban is by far my favourite of the series so it was actually an ideal present. While doing my A-level I was given a couple of French books to practise with but I never got further than a few pages into one of them before giving up. Reading a book is less fun when you have to refer to the dictionary every few words I found. But with HP the obvious benefit is that I already know the story inside out and I can also have the English copy to hand so I could easily look up the exact meaning rather than thumbing through my French-English dictionary. Even so it wasn’t until quite recently that I actually sat down and committed to reading the book all the way through. Right away I found I was disappointed by how much I struggled with the language. Although this is perhaps to be expected as it’s six years been six years since I regularly used French so I suppose I can forgive myself for being a little slower than I might have wanted to be. However something that I noticed very early on is that I was understanding a lot of what was written without referring to my other copy. J.K. Rowling exploits the English language to a massive extent and is incredibly inventive with the terms she employs. This creative use of language seemed to be missing from the French version. Instead of the many varied verbs Rowling finds to use for everyday activities such as walking and talking, the French appear to only have a small number of alternatives. This is great as it made the narrative easier for me to follow but is a sad reflection on the French language. Of course this may all be down to the translator, having never read a native French book I can’t be sure. There were also occasions where the translator had clearly struggled to find an accurate way of translating a name or term. For example; Unfogging the Future the divination textbook was renamed Lever le voile du futur (lifting the veil of the future) which doesn’t have quite the same ring to it. In other instances words were just completely omitted. For instance some of the passwords/insults invented by Sir Cadogan (the old-fashioned knight brought in to replace The Fat Lady) were completely ignored. Although it may sound like it, this post isn’t meant to cast any aspersions on the language of our Gallic neighbours (or the man who translated HP), it is merely a recording of some observations I fell upon while reading Harry Potter et le Prisonnier d’Azkaban and is only meant to serve a as general interest. I thought I’d better clear that up because it seems I’ve been saying all the way through that my language is better than their language which is of course not the case. Perhaps next time I’m at home I’ll dig out Les Chiens perdu sans Colliers or the other native French book I was given at college and find out just how inventive the French language can be. But for now I’m going to stick with reading HP in English and not just because it’s a whole lot faster! My grandmother recently moved house and in an effort to help her “slim down” her vast quantity of belongings so that it would all fit in one lorry, I agreed to go through her bookshelves and see if anything took my fancy. Needless to say there wasn’t a lot which did. 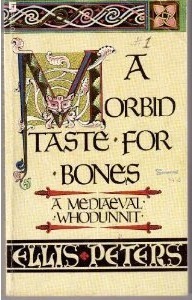 The one thing she did manage to foist on me was a copy of the first book in the Cadfael series by Ellis Peters: A Morbid Taste for Bones. Now it’s fair to say that I have never been tempted by Cadfael; I’m aware of the TV series starring Derek Jacobi and I did know that it was based on books but I never pictured myself reading any of them. So Bones went on my bookshelf and stayed there for quite some time. But there came a time quite recently when I was getting low on new books and needed something small and light to carry around with me so Cadfael was rescued from lying forgotten on the bookshelf and in my backpack it went. I don’t quite know what I was expecting from Cadfael but I was pleasantly surprised by what I discovered. A part of me imagined I would be thoroughly chastised for my heathen ways but I’m glad to say that this was not the case. Naturally God was mentioned now and again but Cadfael himself was refreshingly down to earth and non-devout for a 12th century monk. His scathing assessment of the more devout brothers and blatant cynicism towards the “miracles” occurring throughout the book led me to really warm to the guy which was quite unexpected. The characters may not have been as deep and multi-faceted as they are in other series but for a crime story they were more realistic than I have come to expect. The murder when it came was complex and although I was able to see through most of the red herrings I was still surprised by the outcome. The ending itself was quite a shock, not at all what I had expected from what I previously viewed as a religious series, it would certainly make me think twice before trusting a monk. The old adage about judging books by their covers comes to mind as I’m writing this although in my case it was more like judging Benedictine monks by their habits. Well I have learnt my lesson and while I can’t promise that I’ll read any more of Cadfael’s adventures but should I stumble across one at some point I won’t turn it down flat.